This is a blog where you can follow the second rebuild of “Laura”, the Series IIa Land Rover that I’ve owned the past 25 years. 1962 Land Rover Series IIa 88″ pickup, delivered as new to “Næstved Kirkegaard” (Næstved graveyard) with a 1/3 canvas hood. I received the first parcel with spare parts for Laura today. The box is full of filters, coolant hoses, wires and the rest of the items I need to change Laura’s fluids, and hopefully awaken her engine from its 17 year hibernation. Back in the 1990’s when i bought her, she got her first restauration. In 1966, my father was a young geologist that needed a vehicle that could get him from coast to coast, between, (and into) all the geological sites and quarries in Britain. By chance he discovered that his old teachers four year old Land Rover was for sale in mint condition, he didn’t need to think long about buying it. Shortly there after he was the proud owner, and his Land Rover got him to anywhere he wanted to go, and back again, loaded with rocks and samples. A few years later he met my mother, who also was a geologist, and moved with her to Denmark. His Land Rover was one of the items that he brought with him, and after a lot of paperwork it ended up with danish license plates. 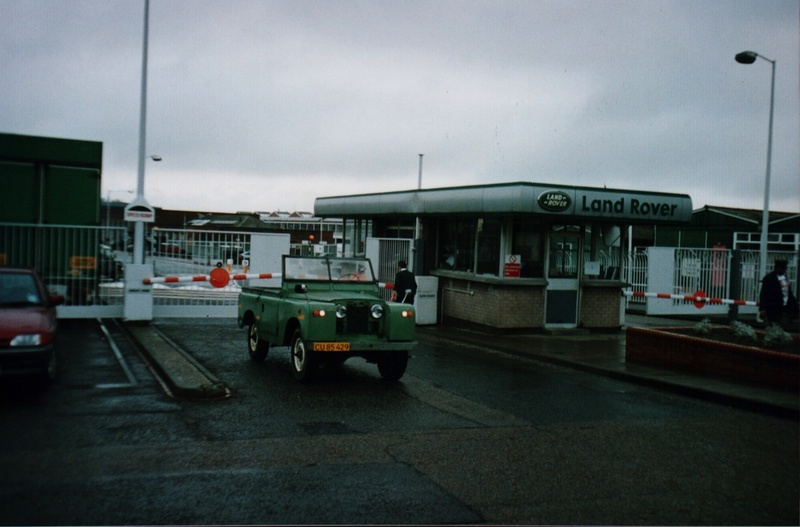 In 1974 I appered, and my earliest memories include his Land Rover, the trips it took us on, in Denmark and abroad. Unfortunately my father sold his beloved vehicle in 1980. He sold it to one of his students, who had admired the Land Rover for a long time, and wanted to drive to India. Unfortunately he didn’t get very far, because shortly after he set out, the Iran-Iraq war broke out, and the whole region was unstable. The student turned the Land Rover around at drove to Iceland instead. After getting to Iceland he spent a long time driving to the remotest parts of the Island, the Land Rover was painted bright red, with a red/white square pattern on the roof, so it easier could be spotted from a distance, if he needed to be rescued. A decade later it was my turn. I fell over an advert for Laura in the local Land Rover clubs magazine, and the rest can be read in the blog section.